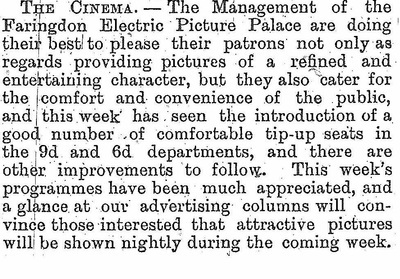 Cinema early 20th Century - Faringdon Community Website. 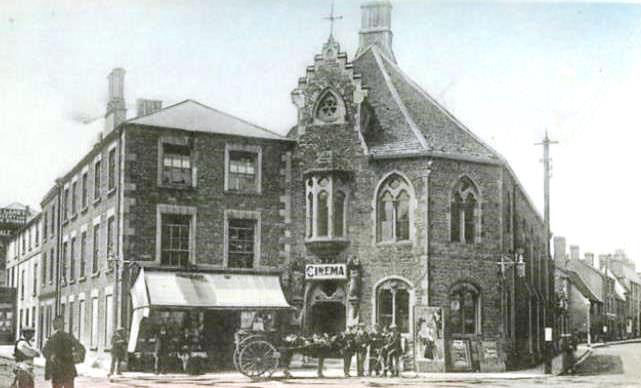 The Cinema at the Corn Exchange, with advertising boards propped-up outside: a photograph taken about 1917. 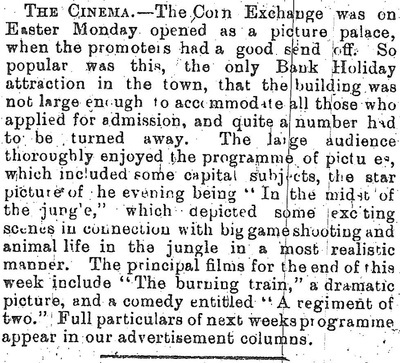 The Corn Exchange is, on Easter Monday, (13th April 1914) to be opened as a Picture Palace, a well-known company having taken the building for a considerable period. 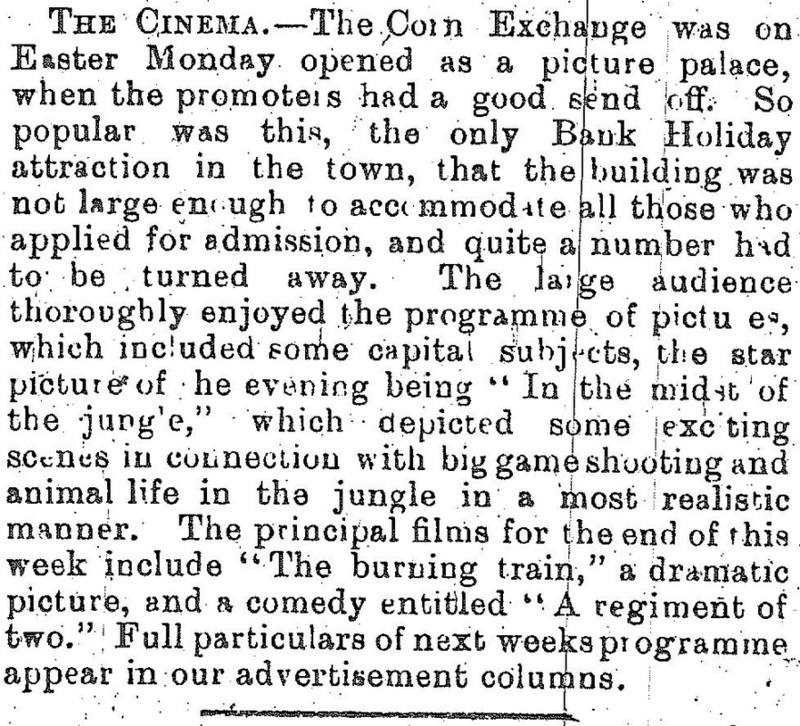 The Corn Exchange was on Easter Monday opened as a Picture Palace, when the promoters had a good send off. 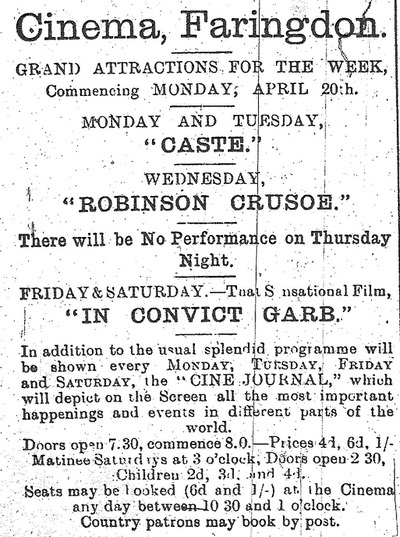 So popular was this, the only Bank Holiday attraction in the town, that the building was not large enough to accommodate all those who applied for admission, and quite a number had to be turned away. 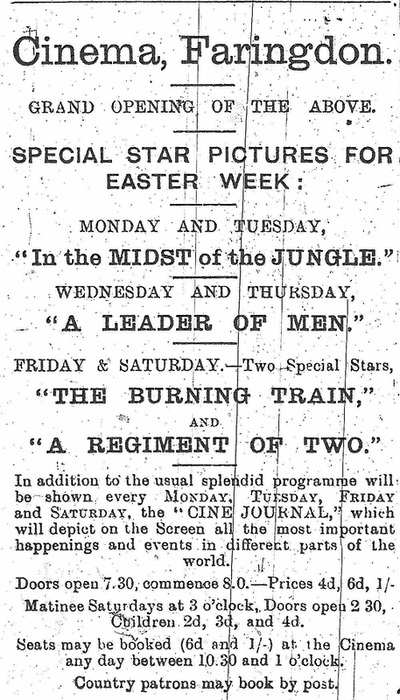 The large audience thoroughly enjoyed the programme of pictures, which included some capital subjects, the star picture of the evening being In the midst of the jungle, which depicted some exciting scenes in connection with big game shooting and animal life in the jungle in a most realistic manner. 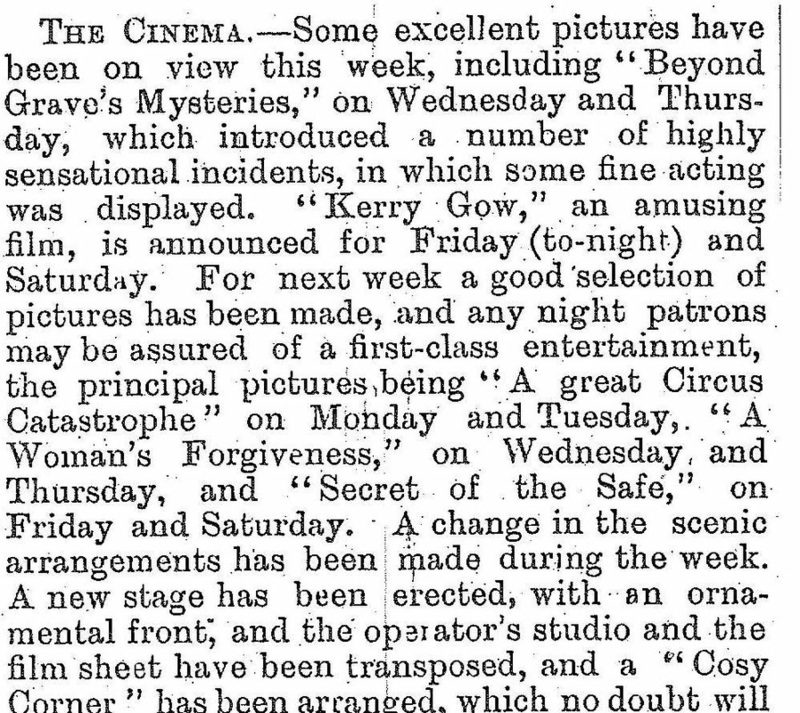 On Monday and Tuesday A fight for fortune should prove very interesting and exciting, together with the usual full programme, and the comedy Mabel’s Lovers. On Wednesday and Thursday two special pictures Foiling the fire fiends, and The Fire Cup will be shown by special request of the Faringdon Fire Brigade, Thursday being the Fire Brigade night. 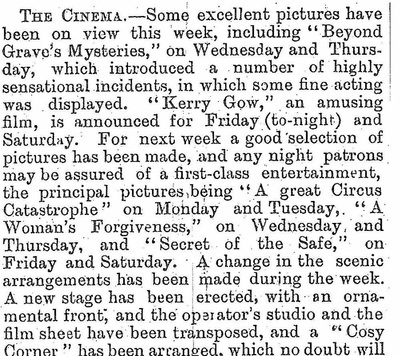 Later in May Mr B Mulford, of the ‘Volunteer’ Inn, treated the inmates at the Workhouse and the children to the cinema on Saturday afternoon, and also gave sweets to the children. 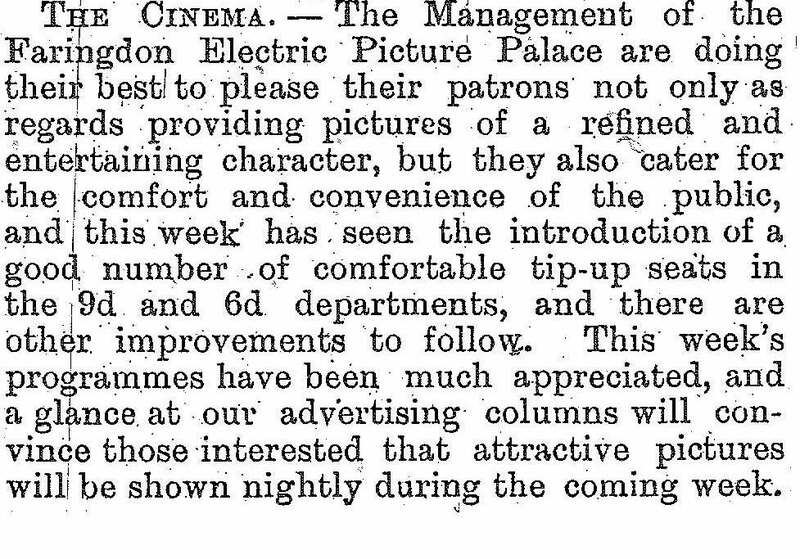 The Management of the Faringdon Electric Picture Palace are doing their best to please their patrons not only as regards providing pictures of a refined and entertaining character, but they also cater for the comfort and convenience of the public, and this week has seen the introduction of a good number of comfortable tip-up seats in the 9-penny and 6-penny departments, and there are other improvements to follow. 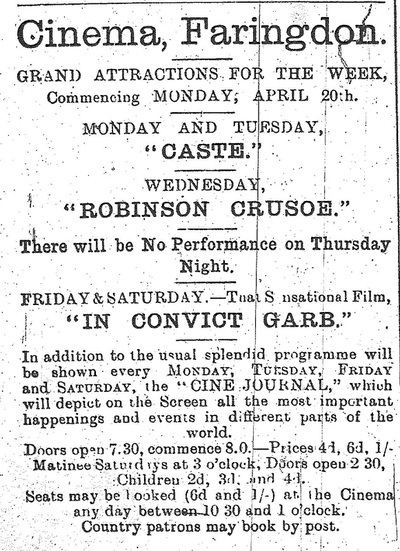 Click on each of the images below to see a bigger image of the advertisements and articles in 1914. 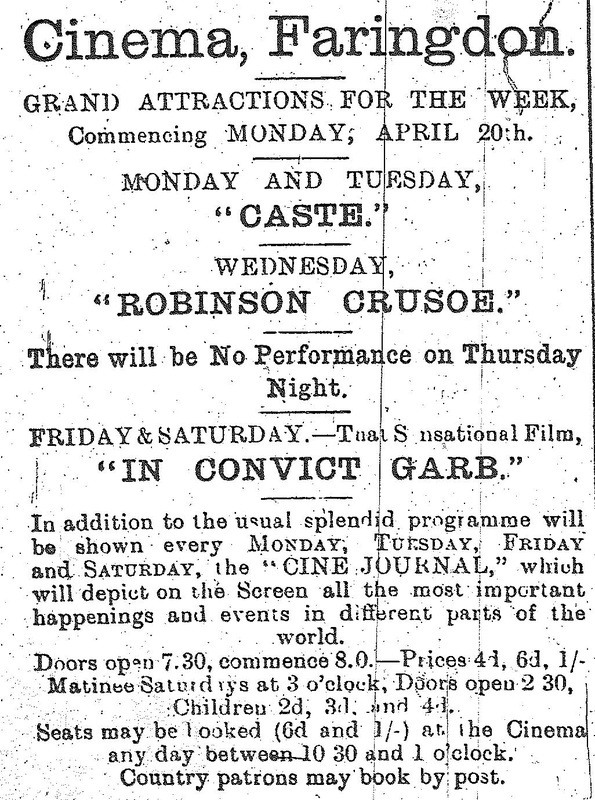 A cinema show in Faringdon! No! I certainly can’t believe it – I shan’t! In the time of Adam, bless him! Not a change would they ever mention. In the year Nineteen Fourteen! Patriotic pictures of the movements of soldiers and sailors have been introduced. Military dramas and patriotic films are included in the programme for next week; pictures will not fail to excite the highest patriotic feelings when The Honour of the Flag, and Our Brave Defenders are shown. The Managers of the popular Faringdon Cinema have again shown their patriotism by arranging an evening’s entertainment in aid of the funds of the Faringdon Branch of the British Red Cross Society. The entertainment took place on Thursday evening (24th September) and was a great success. The seating accommodation was utilised to the fullest extent of the building, and was not sufficient to accommodate the audience. 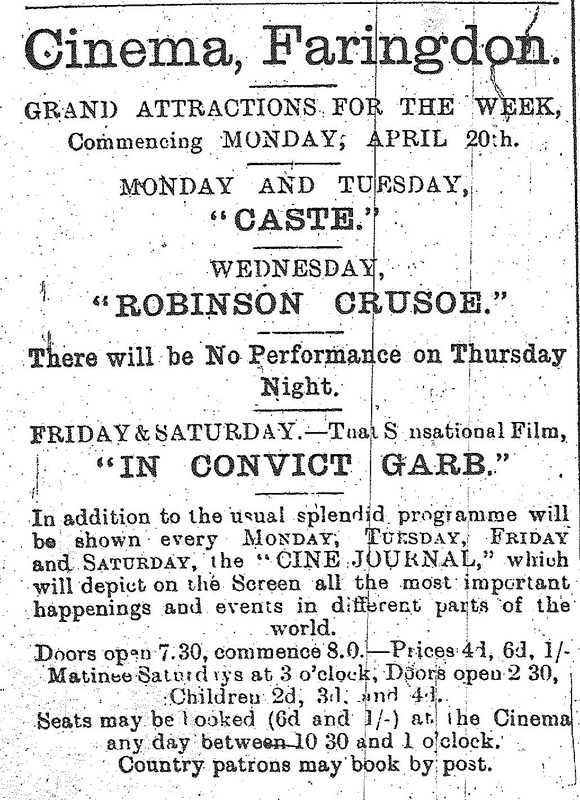 The entertainment was patronised by a number of ladies and gentlemen actively associated at the present time with the local work and arrangements of the Red Cross Society, and assistance in various ways was rendered by the men and women certificated members of the Society, who wore the uniform provided. A capital programme was provided of patriotic and other pictures, interspersed with vocal and instrumental music. Twenty boys and twenty girls, scholars at the Faringdon Council School, were grouped on the platform, the girls wearing red, white and blue sashes, and all carrying miniature flags. They sang in a very hearty and efficient manner, the now popular song, The Lion’s on Guard, and the new recruiting song, Fall in. In a later appearance they sang with equal success, We’ve got a mailed fist too and Land of Hope and Glory. The entertainment closed with the singing of the National Anthem.